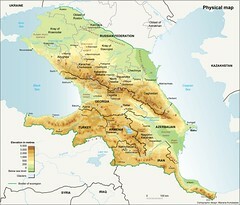 The Caucasus ecoregion covers a total area of 580,000 km2, includes six countries - Armenia, Azerbaijan, Georgia, Iran, Russian and Turkey - and follows the ecoregion definition prepared by WWF in their Action plan for Caucasus. The Greater Caucasus Mountain Range with its lofty peaks forms a formidable barrier between the northern and southern parts of the ecoregion. The Lesser Caucasus mountain chain extends across Georgia, Turkey, Armenia, Azerbaijan and into Iran. For any form of publication, please include the link to this page and give the creator credit (in this case Manana Kurtubadze, cartographer) If the high-resolution file is not available, please contact grid@grida.no for request and permission for usage.